So you like Beetlejuice, eh? Well, don't say his name three times. Why? Because even if he is funny, you know that if he shows up he'll probably wreck your party, that's why. Thankfully, this ghost with the most is a little busy these days. He's been hanging out in the reception room in the afterlife. And, considering how bureaucratic the whole afterlife is, he'll probably be there for a long time. 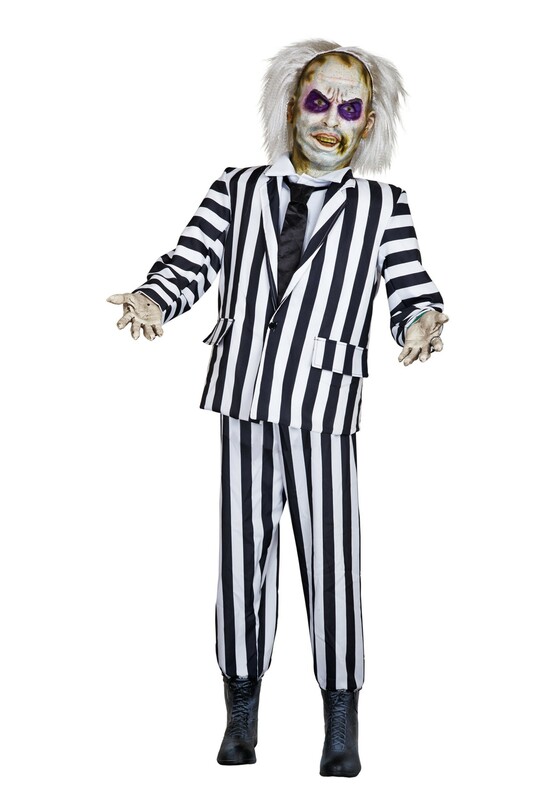 So if you want this illustrious "bio-exorcist" ghost to make an appearance at your party, then you'll need this Life Sized Animated Beetlejuice replica. He's six feet tall and motion or sound activated. He sways side to side and says all your favorite phrases from the Tim Burton movie. Also, he won't try to marry your daughter or kill your dinner guests, which is a major plus. You get all the great lines and the look without the worry of impending chaos! That's the way to handle Beetle... whoops. Almost got ourselves in trouble there.